It’s been a sad week for so many people, not least the family and friends of dog lover and acclaimed artist Stephen Huneck. Here’s an article from ohmidog! 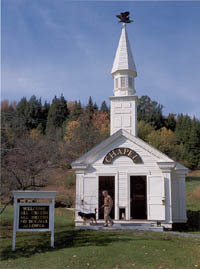 about Huneck, describing his most famous creation, Vermont’s Dog Chapel, his artwork, and his lifelong devotion to dogs. One way to celebrate his life is to savor the kinds of dog-friendly opportunities that are available now but weren’t just a few years ago. Here’s one: Writing a guest post for GoPetFriendly, Leila Peverett of And A Small Dog describes the very dog-friendly TradeWinds Island Grand Resort in St. Pete Beach, FL. And here’s another: In a throwaway line about visiting Sutter Creek-area wineries, a post by The Wineries of California references the “mega-dog friendly Drytown Cellars.” The winery is in the heart of Amador County, CA, and its wines are getting some nice awards. I look forward to traveling to the U.K. with Chloe, but it’s not yet on the cards. Until I come to grips with the PETS scheme, other people’s experiences will have to do — and here’s a good report from American Gal’s Survival Guide to Life in England about bringing her dog George from Los Angeles to Heathrow. But say you can’t bring your dog with you — take a look at this short video from Peter Greenberg Worldwide about borrowing a dog for hikes or companionship from some hotels and from dog shelters in the locations you’re visiting.